This article is about the special election held for Pennsylvania's Class 3 Senate seat. For the elections held that year for the Class 1 seat, see United States Senate election in Pennsylvania, 1922. 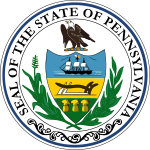 The 1922 United States Senate special election in Pennsylvania was held on November 7, 1922. Incumbent Republican Senator George Pepper, who had been appointed to the seat by Governor William Sproul following the death of Boies Penrose, was elected to fill the remaining four years on the term to which Penrose had been elected in 1920. Pepper comfortably defeated five other candidates, including Democratic nominee Fred Kerr of Clearfield County. ^ "Washington's Eyes On Pennsylvania". The New York Times. May 16, 1922. Retrieved August 8, 2012. ^ "PEPPER, George Wharton". The Biographical Directory of the United States Congress. The United States Congress. Retrieved August 8, 2012. ^ "Statistics of the Congressional Election of November 7, 1922" (PDF). Office of the Clerk of the U.S. House. Retrieved 9 July 2014. This page was last edited on 15 December 2018, at 20:12 (UTC).